Just wanted to let you know that these CRISPY, flavorful Sheet Pan Paleo Za’atar Chicken Thighs are sponsored by my friends over at Manitou Trading Company! This Za’atar Chicken Thigh sheet pan dinner is an easy healthy, low carb and keto dinner with bold Middle Eastern flavor! Learn the secrets to crispy chicken! And when I say “crispy” I mean BUSINESS. You know that my inner texture-freak does NOT mess around and these are the CRISPIEST paleo baked chicken thighs EVER. I know because I tested them eleventy billion different ways (which might be a SLIGHT exaggeration) to ensure that the TAHINI and ZA’ATAR crusted (omg!) skin reached the ULTIMATE of beautiful, crispy-crunch-a-rific golden brown textured goodness that is going to make your taste buds pretty much fall off your head. I was a person who always said she “didn’t like chicken skin” because of the weird, rubbery and “jello-y” texture that it can sometimes have, so I’ve been avoiding it like a worm avoids a puddle for all almost-28 years of my life. UNTIL I learned the secrets to making the crispiest, juiciest chicken thighs. Which you are ALSO going to learn today. Don’t you just feel so happy that you got out of bed this morning? Sidenote: not sure if worms actually avoid puddles but, in my head, puddles seem like they would be VRY VRY dangerous to worms so it makes sense. Also, why are we talking about worms when there are CRISPY baked chicken thighs at hand? 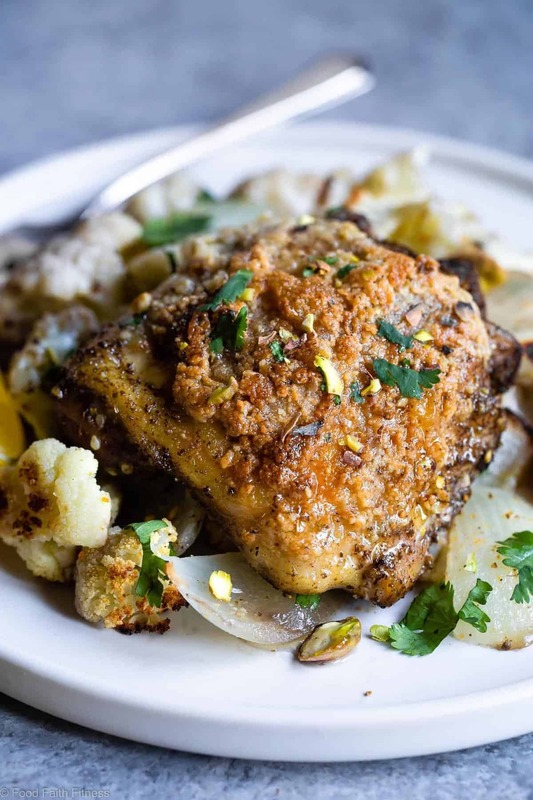 Golden brown, ultra-crispy chicken thighs with big, BOLD Middle Eastern flavors, served with a side of the most tender, equally flavorful roasted cauliflower is going to be your new favorite back-pocket dinner that makes you feel SO fancy and cultured when you eat it. But, like the cashew chicken sheet pan dinner and Asian Miso Steak Sheet Pan Dinner it basically makes itself and on only ONE PAN. Oh, HELLO winner winner easy chicken thigh DINNER. Although the crisp-nosity (word?) 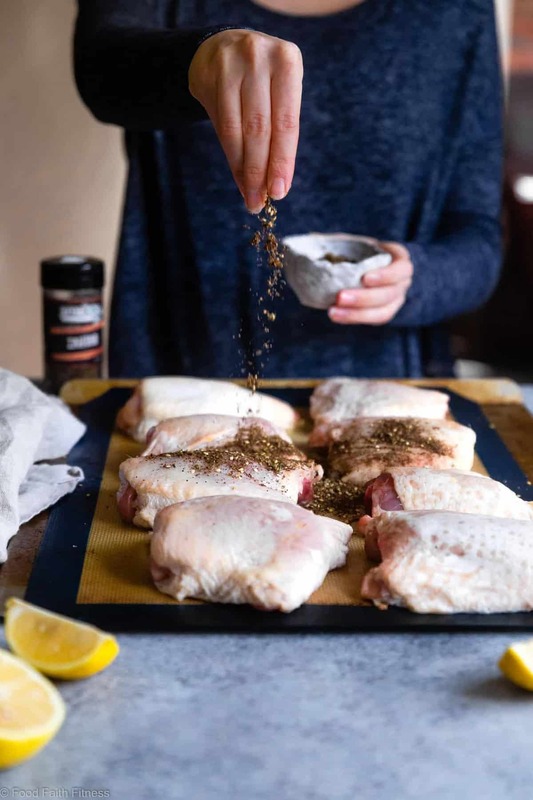 of the chicken thigh dinner situation that we currently find our real-life-selves in is HIGHLY exciting and yummy, the recipe MVP is Manitou Trading Company! Not only do they make some CRAZY delicious and TOTALLY unique, responsibly-sourced products (hello UMAMI DUST or Moroccan Couscous) but they believe that natural food is better and many of their products don’t have artificial ingredients, added flavors colors OR preservatives. Many are also gluten free, vegan, non-GMO A-N-D they make sure to clearly label any allergens RIGHT on the package. No weird ingredients. Just wholesome, high-quality REAL and DELICIOUS food and spices coming from Manitou Trading Company. Mr. FFF and I first fell head over taste buds in love with their Dukkah seasoning and have been putting it on everything forever and ever since. Then we met Zahtar and the addiction? RUNS SO DEEP. 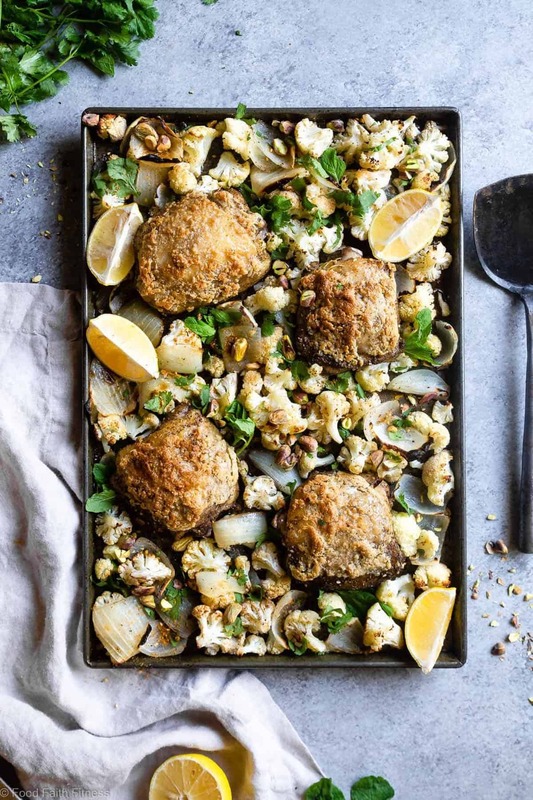 Especially when they’re married together in these Crispy Sheet Pan Paleo Za’atar Chicken Thighs. <– OUT OF THIS WORLD ethnic flavor MAGIC. 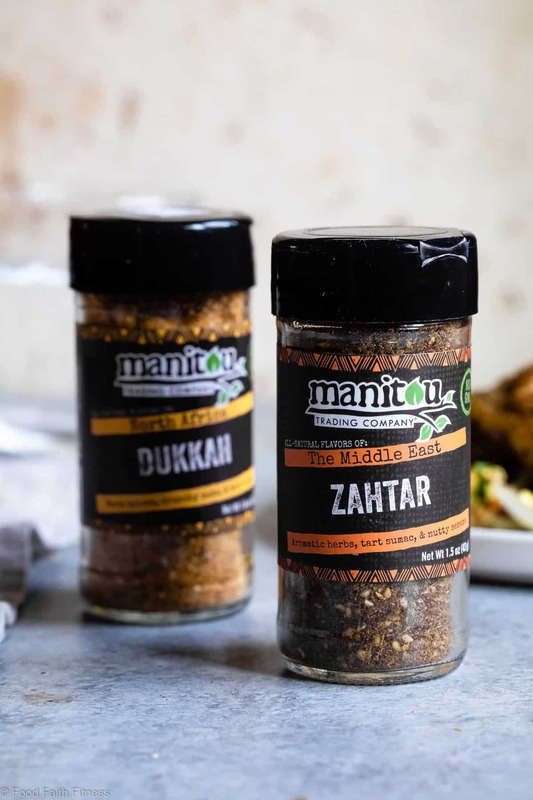 Dukkah is an aromatic spice blend from North Africa that is a blend of different nut meals, seeds and spices and is typically served sprinkled in olive oil for dipping pita bread. 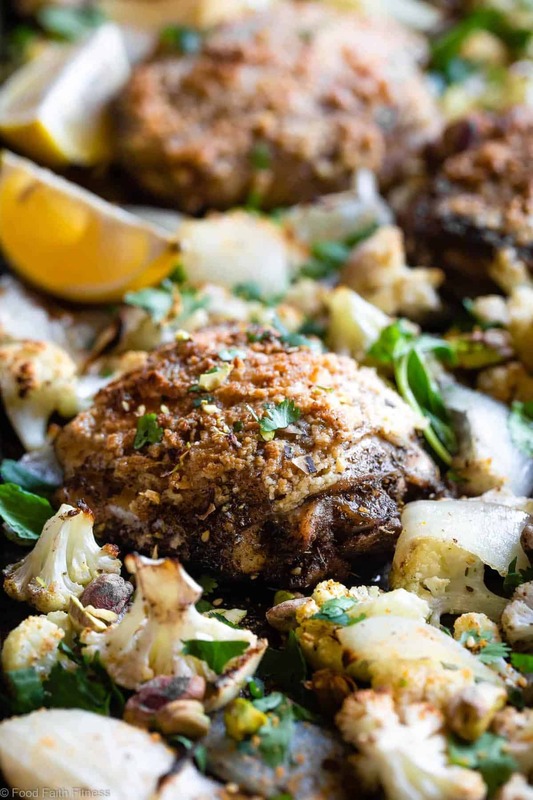 But it is also good on TONS of other things, like the cauliflower in these Sheet Pan Paleo Za’atar Chicken Thighs! Za’tar (pronounced zah-tar) is a Middle Eastern aromatic spice blend of sesame seeds, marjoram, thyme and sumac! You can already taste the Middle Eastern flavor POW dancing across the tip of your tongue, can’t you? Now, let’s talk crispy chicken. Pat them dry and let them sit UNCOVERED in the fridge overnight. This allows the skin to get nice and dry so that it crisps up in the oven! Rub the skin with oil and baste with the cooking juices as it cooks. Cook your chicken thighs at a HIGH heat (450 degrees) in the top third (hottest part) of your oven! How Long Do You Bake Chicken Thighs? 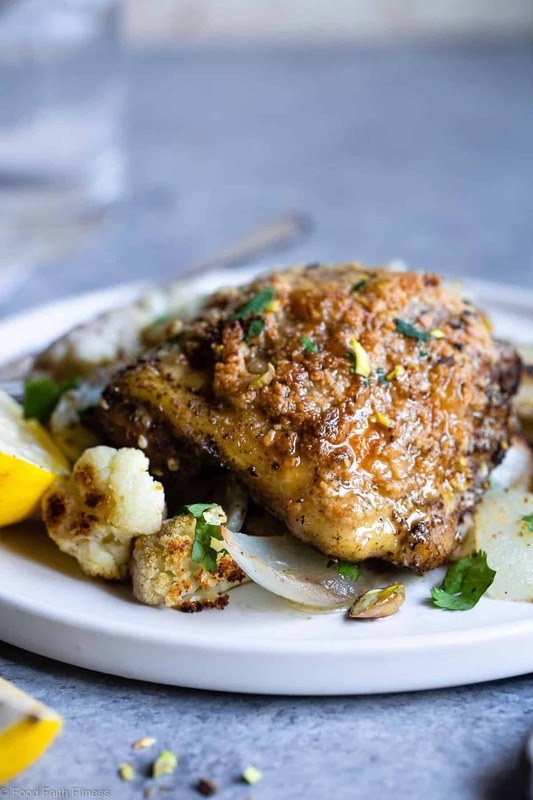 You want to bake your Sheet Pan Paleo Za’atar Chicken Thighs long enough, so the skin is crispy and the inside registers at LEAST 165 degrees. Following the above steps, this will take 25-30 minutes! I am foreseeing a lot of crispy chicken in your future now that you’re in the KNOW. But, MAN OH MAN I’m BEAT after all that spice and chicken thigh baking learning, aren’t you? I think we can both agree that bold flavored, tahini-crusted chicken is gonna refuel us JUST FINE. 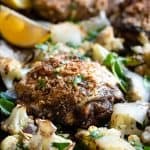 Sheet Pan Paleo Za’atar Chicken Thighs are an easy healthy, low carb and keto dinner with bold Middle Eastern flavor! Learn the secrets to crispy chicken! Pat the chicken thighs as dry as you can with paper towel and then lay them skin-side up on a large plate. Refrigerate uncovered overnight so that they get nice and dried out. Toss the cauliflower and onion with 1 1/2 Tbsp of the oil and spread on a large baking sheet, sprinkling with a pinch of sea salt. Place the dried chicken thighs in a large bowl and mix with the Zahtar, making sure the thighs are coated on all sides. Sprinkle with salt. Nestle the thighs, skin-side up, among the vegetables, making sure to not crowd the vegetables. Bake until the chicken skin begins to brown and crisp, about 20 minutes. While the chicken cooks, whisk together the tahini, lemon juice and remaining 2 tsp of oil until thick and well mixed. After 20 minutes, baste the chicken which the juices from the pan and bake an additional 5 minutes. Then, divide the tahini mixture on top of each thigh and spread out with a spoon evenly. Bake another 5 minutes, until the tahini is lightly brown and the chicken reads at least 165 degrees when the temperature is taken near the bone (if it reads a higher temp, that is okay too!) Finally, broil 2-3 minutes to really crisp the skin. Squeeze a little bit of fresh lemon juice over the whole pan and then divide the chicken between 4 plates. Then, toss the vegetables with the cilantro, mint and Dukkah and divide between the plates. Chop the pistachios and divide between the plates. THIS POST IS SPONSORED BY MY FRIENDS AT MANITOU TRADING COMPANY. THANK YOU FOR ALLOWING ME TO CONTINUE CREATING GREAT CONTENT FOR YOU BY SUPPORTING PARTNERSHIPS WITH SUPER-FAB BRANDS THAT FOOD FAITH FITNESS LOVES TO WORK WITH! AS ALWAYS, OPINIONS REMAIN 100% MY OWN! Wanna find Manitou products? Yes you DO! You can find certain products at Walmart or their website HERE. Looks and sounds fabulous. I feel like I can smell how good this is. Pinning. Yummmmmmmmmmmmm, this is a good looking plate of chicken!! I like the story about the worms, haha, even if you are visualising them when talking about food. I don’t think they like puddles either by the way. Thanks and pinning!! Haha! I am glad it’s not just me 😉 Thanks Adrianne! I love using chicken thighs- they have a whole other moisture level! And the spices you chose are perfect! Same! So much yummier than breasts! Thanks Katie! This looks like such a moist and flavorful dish! We would love this recipe. I love sheet pan anything. But with a name like that I got to try this! You would LOVE it Matt! Thanks! What a delicious, easy way to spice up a healthy meal. Such a delicious recipe! I love a one pan meal but these spices take it over the top; fantastic! You would LOVE this one Toni! Thanks! It looks absolutely delicious – love that you used cauliflower! These chicken thighs are cooked perfectly! Love that za’atar you used. I just love Za’atar and you’ve used it brilliantly in this chicken! So perfectly crisp! Me too Liren! Thank you!